The Active Bypass Diode of OKE is an active electronic smart circuit, which can replace bypass diodes in PV-modules. The Active Bypass Diode is extremely thin and, therefore, can be integrated in the PV laminate. This offers many advantages! Bypass diodes are commonly used in PV modules to prevent overheating of a cell under partial shading conditions. The forward voltage of the bypass diode depends on the type, the junction temperature and the current, is usually in the order of 0,5 to 1 Volt. Since PV cell efficiencies and PV cell dimensions are increasing, higher currents may flow through the bypass diodes which will lead to increased dissipation in the diodes. To avoid overheating, additional cooling for example by means of a heat sink is necessary. Moreover, there is a tendency to larger modules with more cells which will result in an increased number of bypass diodes per module. In order to avoid overheating in the junction box, either multiple junction boxes or larger heat sinks are required. These measures, which need to be taken to avoid high temperatures in the diodes and junction box(es), will increase the costs of PV-modules. 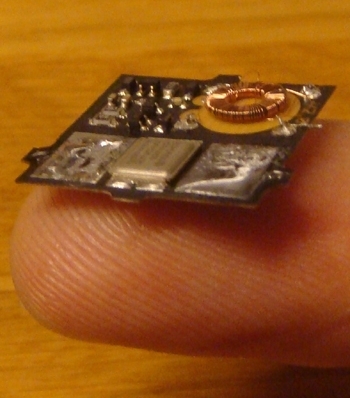 To solve these problems a small electronic circuit was developed which we call the smart PV-diode. The maximum forward voltage drop is approximately 0,05 volts, at least an order of magnitude smaller than a normal diode, resulting in a corresponding reduction in heat dissipation. These active diodes are extremely thin and, therefore, can be integrated in the PV laminate. Henk presented the design at the 22nd EU PVSEC in Milano on the 6th of September. Since then no progress has been made cause of lack of interest. When you are interested please contact us at oke@euronet.nl.